Tonight, we broke down EBro’s latest attempt at stirring the NY vs. the world hip-hop pot, talked about Sean Price’s posthumous release and album release event, coming out August 8, plus a rundown of new NY-area hip-hop releases of note, including Tanya Morgan, Wiki, Skyzoo and more. Tonight, #RIPProdigy, exclusive JSWISS interview/announcement, event (p)reviews, serendipitous hip-hop meetings on the streets of Newark, and YOU! 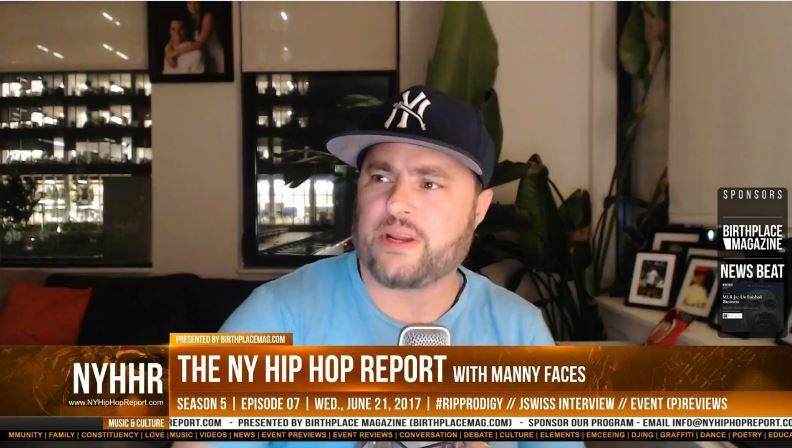 On this episode of The NY Hip Hop Report with Manny Faces, you know we had to pay respects to the late Albert “Prodigy” Johnson, of the legendary Queens hip-hop group Mobb Deep. Prodigy passed away unexpectedly, leaving a hole in the heart of many a hip hop fan, from Queensbridge to the world. Manny showed love by playing a piece of a Complex interview with Prodigy, where the veteran MC gave sage advice about paying attention to one’s health. Coming from one who had to deal with a number of health issues throughout his life, it was fitting to show such a vulnerable perspective from one of hip-hop’s most respected artists. Despite some unexpected technical glitches, Manny was able to play a pre-recorded interview with JSWISS, a talented young artist who has released quality music for a while now. Often found rocking with a live band, JSWISS announced his monthly Rockwood Music Hall residency, which will see the MC and a slew of talented musicians hitting the stage to bring a unique and organic display of MCing and live music. Keep an eye on the Birthplace Magazine New York hip-hop event calendar for more information. 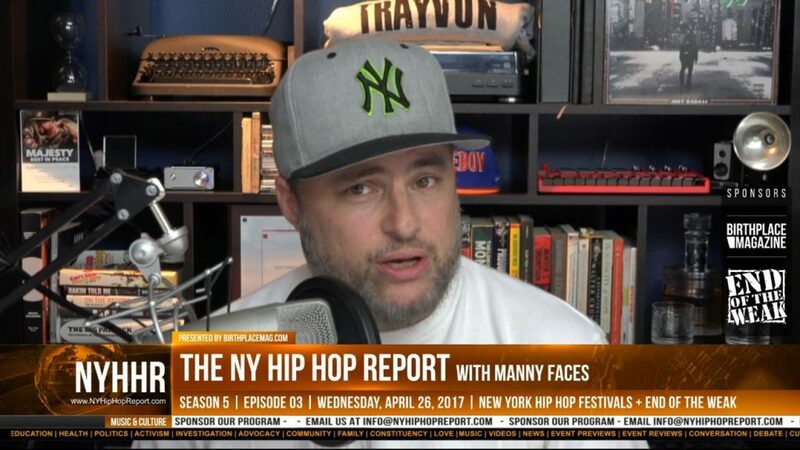 Speaking of the calendar, Manny ran through several upcoming events, being sure to cast deserved light on events that focus on more than just the music part of hip-hop, showing once again that few media personalities represent New York hip-hop music AND culture more than Manny Faces and The NY Hip Hop Report. 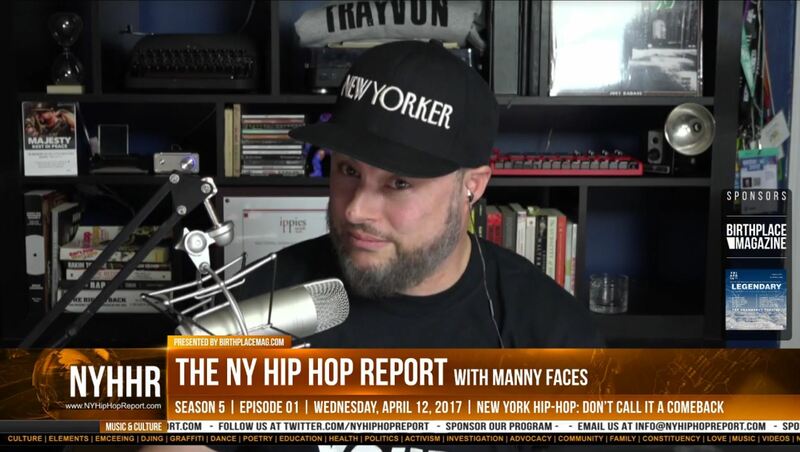 Catch this episode of The NY Hip Hop Report and join Manny LIVE every Wednesday night at 10pm here or on Manny’s Facebook page. 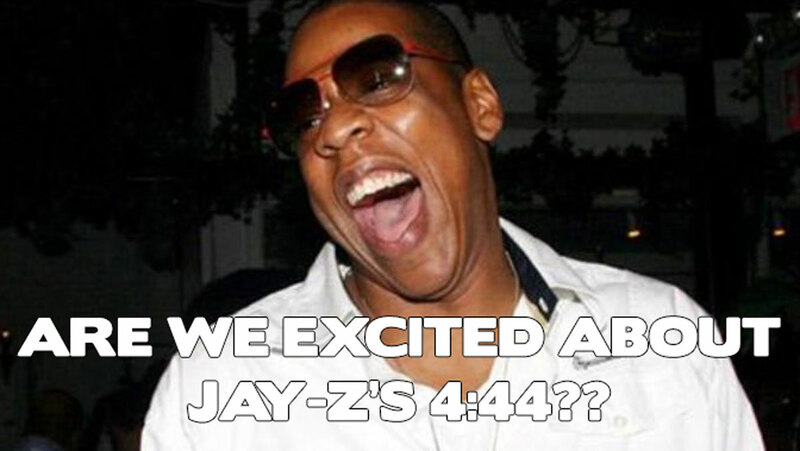 S05E06: Will the real hip-hop museum please stand up! Tonight: Why a hip-hop museum/hall of fame is a great idea — and a horrible one. Plus, we recap a few choice NYC hip-hop happening, including the U.S. album release from Illspokinn & DJ Zajazza, the incredible #HipHopHacks event from Hip-Hop Hacks, Hip-Hop Education Center & Spotify & Monthly Music Hackathon NYC. Tonight’s episode is brought to you by Birthplace Magazine and US News Beat. This episode brought to you by BirthplaceMag.com and News Beat, an innovative new music+journalism project. While hip hop museum project announcements are excitedly shared across social media, the main problem as Manny Faces sees it, is that there are nothing more than plans and ideas at the moment, among several unrelated and in some cases, poorly operating entities. While it is a natural reaction to be interested and excited when a regurgitated press release appears on a local blog (or even a major website), the lack of background and fact checking in most hip-hop related journalism ends up allowing the entities to play the public like fools. The most egregious move by almost all of these entities, Manny explains, is the money grab from the fans. Various crowdfunding campaigns have been run by all of these prospective builders, but nothing of substance ever gets produced. Some of these organizations then fall to the wayside. It is with this in mind that Manny implores fans and members of the hip hop community who would normally be highly supportive of such a project, to hold off before donating, and investigate the project and its backers to determine if financially supporting the project is in their best interest. 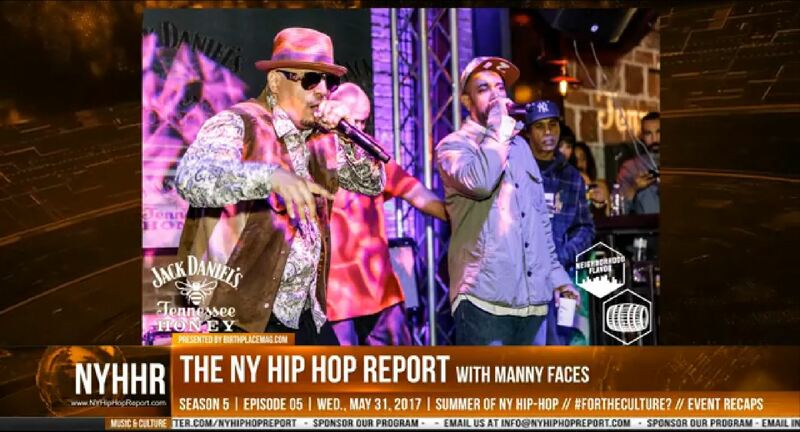 The NY Hip Hip Report with Manny Faces returned for a fifth episode in its new Facebook Live, video/vodcast/podcast format, recapping several New York City-area hip-hop events, most notably, the Jack Daniel’s Tennessee Honey “Sabor Del Barrio” event held at the swanky Paper Factory, which paid homage to the contributions of several notable Hispanic artists and creatives that hailed from the borough of Queens. A photo slideshow accompanied Manny’s commentary, highlighting hip-hop group The Beatnuts and renowned visual artist Danny Hastings. 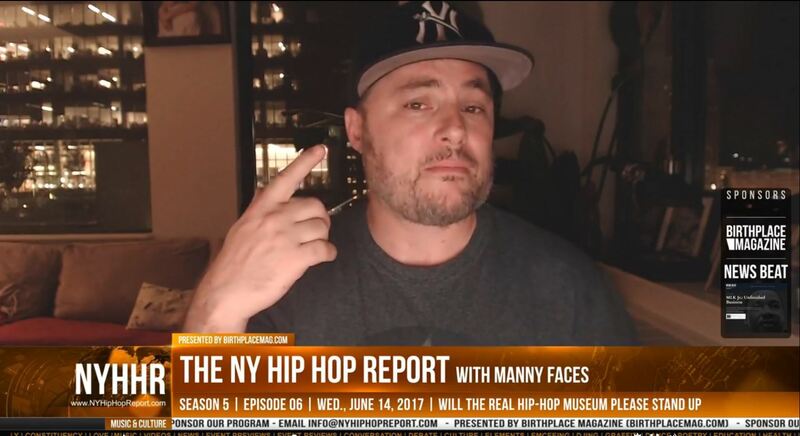 Along with that recap and others, Manny previewed upcoming NY-area hip hop events of note, and then spend a good deal of the show discussing the high prices of certain hip-hop festivals, in particular, the Brooklyn Hip-Hop Festival. New episode of The NY Hip Hop Report! Recaps of some select recent events, previewing upcoming summer events, and a discussion regarding hip-hop festivals, the Brooklyn Hip-Hop Festival in particular, and their increased prices… #NYHipHopCNN #NYHipHop! Many viewers added to the discussion in the comments section, having strong opinions on the drastic increase in pricing for tickets to the Brooklyn Hip-Hop Festival, and other large-scale hip-hop-related events that seem to be pricing out some of the very audience that helped them achieve their renowned status throughout the years. While many lamented the days when these sorts of things were much cheaper — free even — Manny and other viewers made it clear that there shouldn’t be an expectation that hip-hop enterprises can’t thrive and be profitable — only that the caliber of the event much match the cost, and in a rapidly gentrifying place like New York City, jacking up prices to the levels that price out hometown hip-hoppers, is not something that sounds very much #ForTheCulture. 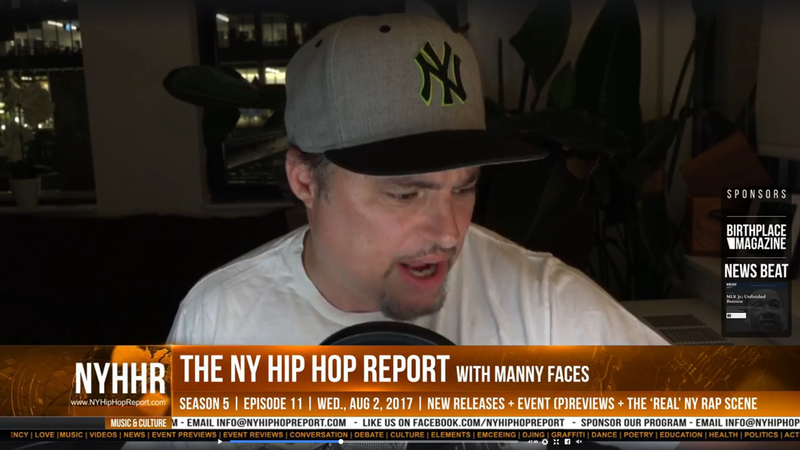 The NY Hip Hop Report with Manny Faces continued with its new format and flow, airing another episode via the Facebook Live platform. In this episode, as always, Manny Faces shed much needed light on the plethora of New York area hip-hop-related happenings, by recapping the past week (including star-studded concerts by iconic veterans like T.I. and buzzing up-and-comers like A Boogie Wit Da Hoodie) and previewing upcoming events (including the lyrical legend Kool G. Rap’s album release party coming up at NYC’s B.B. King Blues Club). #NYHipHopCNN is back! 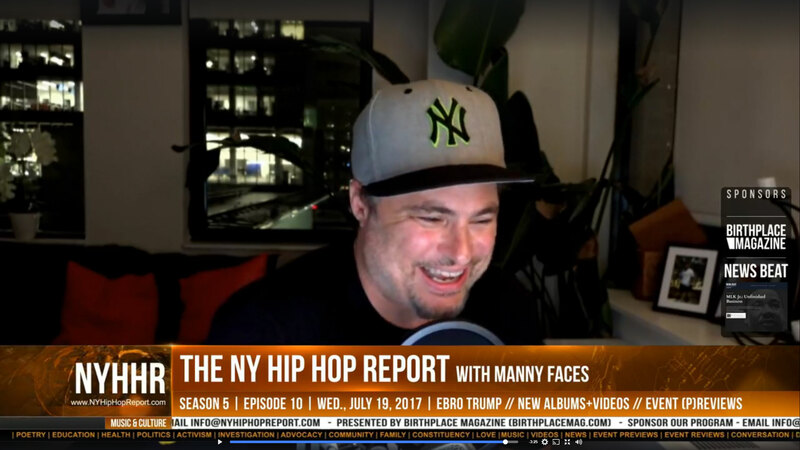 The NY Hip Hop Report with Manny Faces, E05E04 – We have NY-area hip hop news and event reviews/previews, plus my interview with Karim Bourhane / Napoleon Da Legend about new music. Charlamagne Tha God, #BlackPrivilege and more. Plus, your comments and a big TICKET GIVEAWAY.. TUNE IN! Manny also welcomed to the groundbreaking new video format, the DMV-to-NYC lyrical and substantive dynamo known as Napoleon Da Legend. This talented lyricist has dropped well-produced, thoughful and head-nod worthy bangers for years, and just recently — off of the strength of his two recent mixtapes Steal This Mixtape and Steal This Mixtape Too — spoke on the concept of “Black Privilege,” both through his music, and as it relates in particular to Charlamagne Tha God, who reecently penned a now best-selling book by the same name. In fact, the two men had a brief encounter due to the mutual appreciation for the phrase, which left Napoleon Da Legend feeling some type of way about CThaGod’s true motivation. Manny Faces invited Napoleon Da Legend to the show to discuss his recent music, #BlackPrivilege as HE sees it, and what Charlamagne Tha God might could have done better. 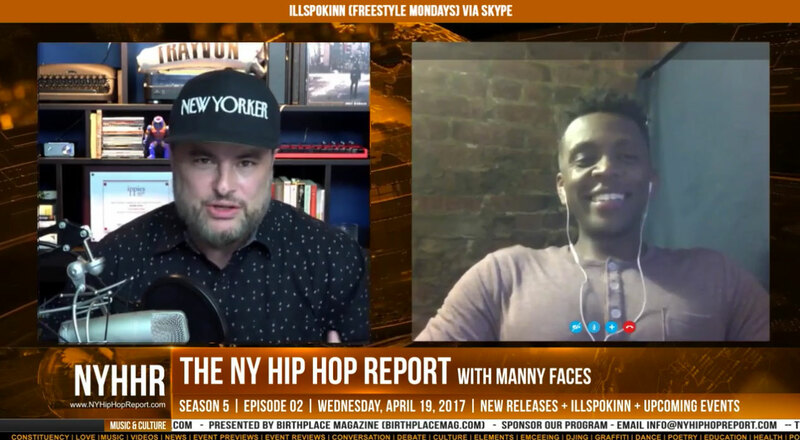 As always, New York hip hop music and culture was represented and reported on in a way that no one besides Manny Faces could deliver, as he broke down some of the recent news and releases that are important to the NY-area hip-hop community and fanbase.